During the 1970s, Mexico engaged in a "dirty war" against left-wing dissidents and suspected "subversives," resulting in the arrest and "disappearance" of hundreds of its own citizens. In many instances, the children of the "disappeared" were adopted by other families. Since 2000, long-secret documents about these events have become public, revealing the stories of these missing victims of the "dirty war." TRACING ALEIDA relates the story of 31-year-old Aleida Gallangos, who discovered her true identity only in 2001, and her 3-year-long efforts to locate her older brother, from whom she was separated at the age of 2 when their parents were arrested by state security forces in 1975. 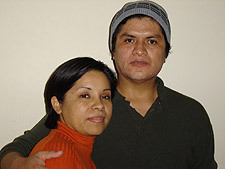 Researching adoption records, Aleida traced her brother, Lucio Antonio, to a Mexican family living in Washington, D.C. This documentary interweaves Aleida's contemporary efforts to locate and arrange a meeting with her long-lost brother, now known as Juan Carlos Hernandez, with the personal and political history of her parents, including the raid on a guerrilla safe house that resulted in their disappearance and the separation of the two children, and culminates in an emotionally moving reunion, after 29 years, between Aleida and her brother. 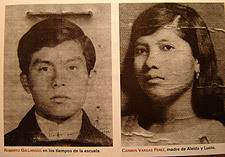 TRACING ALEIDA shows that while Aleida and Lucio are learning to reconcile two separate personal and family histories, Mexico itself is engaged in a likewise problematic effort to acknowledge the atrocities committed against its own people and the possibility of indictments against previous government officials responsible for them. Tells the story of Deni Prieto Stock, killed by the Mexican army in 1973.